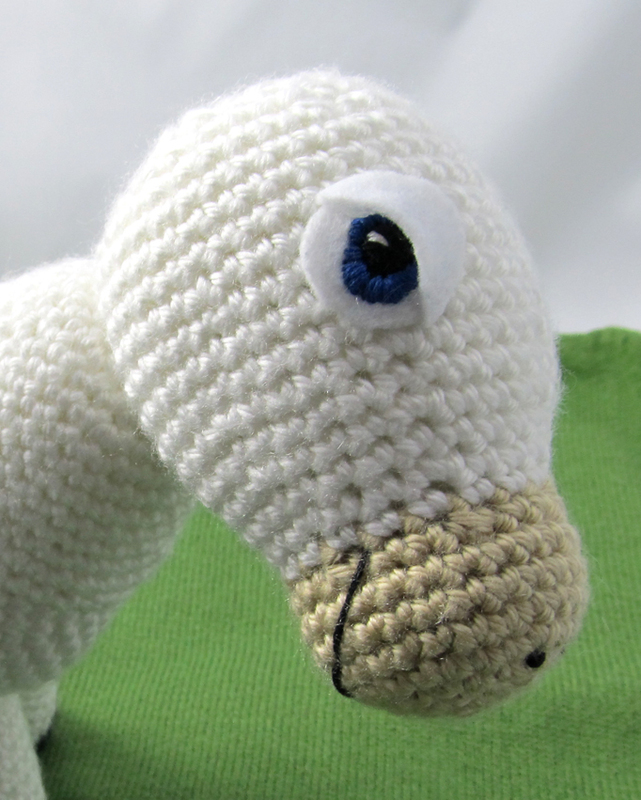 I accepted Bill’s challenge both because I admire his work and just really like him as a person and because, much like Bill had never drawn a horse before Rainbow Donkey, I had never crocheted a horse/donkey/unicorn before. 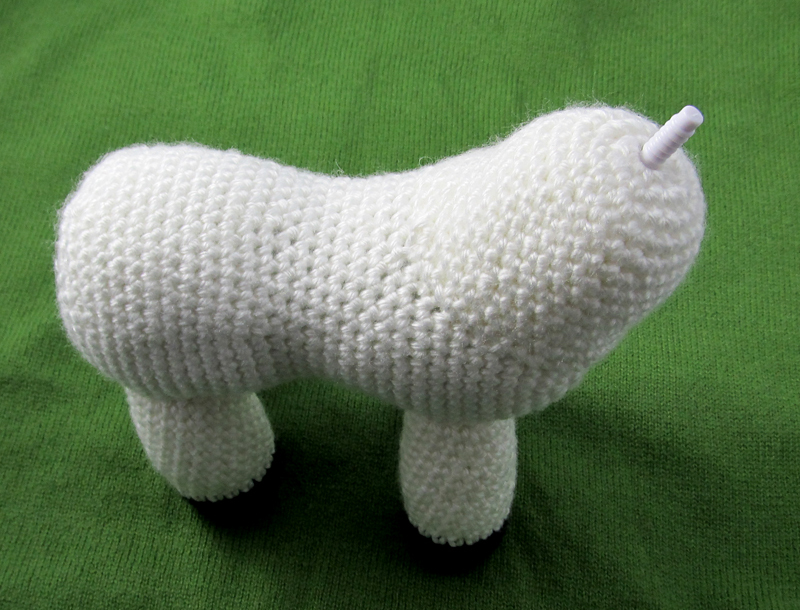 It turned out though that crocheting a donkicorn wasn’t the most difficult part. The toughest thing about this challenge was trying to capture that rough but loveable charisma that has made his donkicorn character so popular among fans. It might have something to do with his illustration style. Bill does most of his sketching by hand, then uses MS Paint (I’m so impressed by anyone who has the patience to draw a comic in Paint!) and Photoshop to bring the images to digital life. Click here to see how he draws his comics. Click here to see how he creates his single-frame images in Paint too! This process creates scenes that are bright and lively and, he admits, a little rough around the edges. 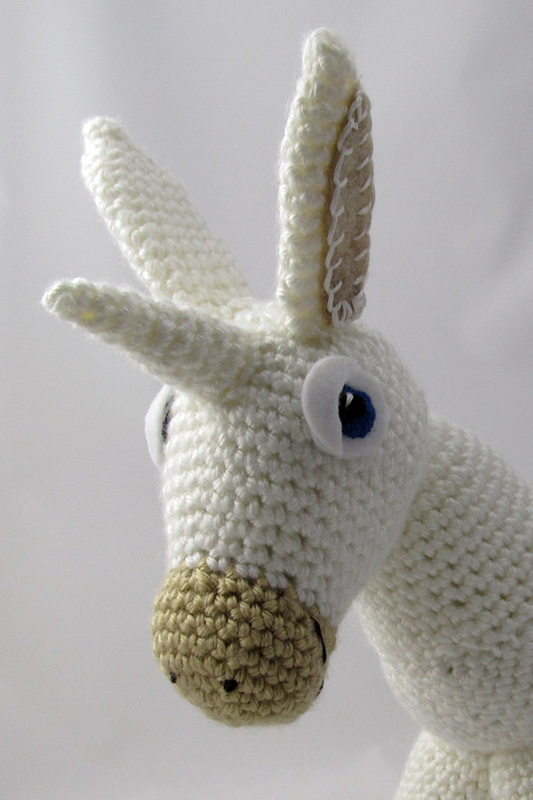 I think that’s what makes them so endearing, and it was my biggest hope that I would be able to capture that quirky beauty in my crocheted version of Rainbow Donkey. I hope that you, too, can see the charm in his stubby feet, giant ears, and crooked smile. Because like Bill says, it’s our flaws that make us loveable. Click here to read more of my interview with Bill. Rnds 8-15: Sc in ea sc around. Rnds 17-19: Sc in ea sc around. Rnds 21-24: Sc in ea sc around. 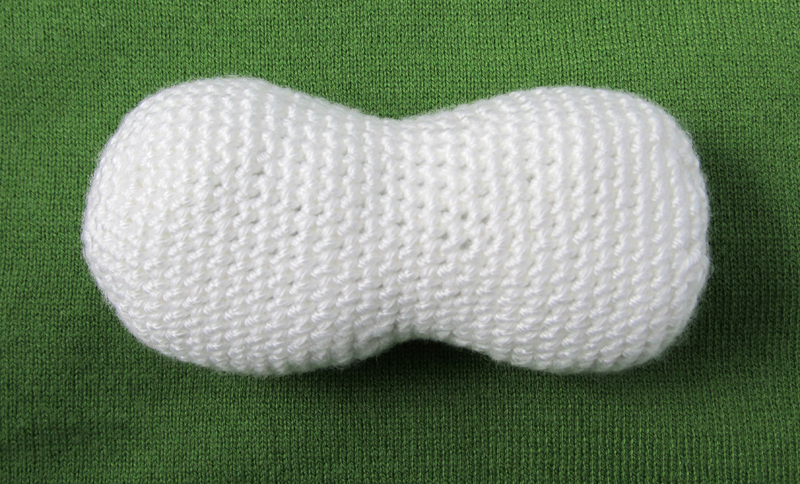 Fill this half of the body with Fiberfill before continuing with pattern. Rnds 27-34: Sc in ea sc around. FO, leaving a long tail. Thread the tail through FL of remaining 6 scs. Pull hole closed and weave in ends. Rnds 4-6: Sc in ea sc around. Rnds 7-17: Sc in ea sc around. Stuff and sew the open end of each leg to the underside of the belly. Rnd 4: Sc in ea sc around. Rnd 6-10: Rep rnd 4. Push the male end of the doll joint connector up through the middle hole in the top of the neck. Stuff the neck and sew to the body. It might be easier to secure the neck in place with pins before sewing. This looks so weird. Give him a head STAT! Cut felt into 3 circles, each with a diameter of about 1”. 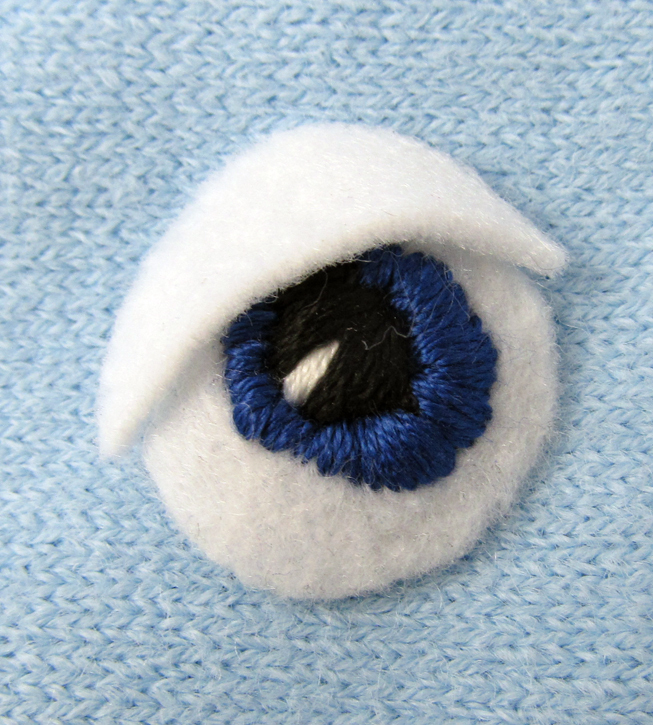 Using black, white, and blue floss and a satin stitch, embroider the pupil, iris, and reflection on 2 of the 3 circles. Cut the third circle in half, then trim each into a half-moon shape. 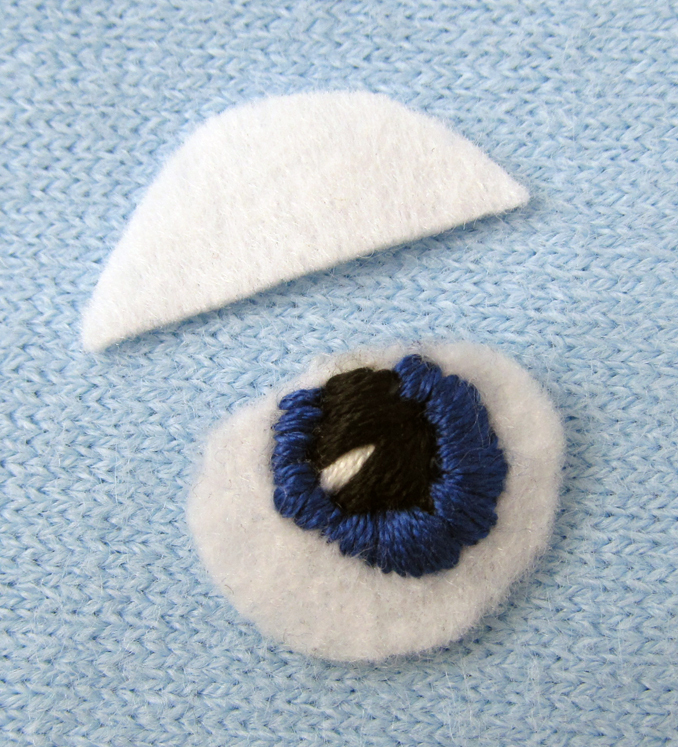 Using hot glue or fabric glue, attach each semicircle on the top half of the eye as an eyelid. Set the eyes aside for now. With beige yarn, ch 2. Rnds 5-7: Sc in ea sc around. Rnd 9: Sc in ea sc around. Rnd 11: Rep rnd 9. Rnd 13: Rep rnd 9. Rnds 15-21: Rep rnd 9. Now is a good time to sew on the eyes that you had set aside earlier and embroider the nose and mouth with black embroidery floss. Note: in placing the eyes, I found it helpful to stuff the head first, pin on the eyes, and then remove the stuffing in order to sew them on. Push the male end of the doll joint connector through a hole in the bottom center of the donkey’s head. Thread the washer and female end of the joint on. Pop the two pieces together to attach the head to the neck. Stuff head with Fiberfill. 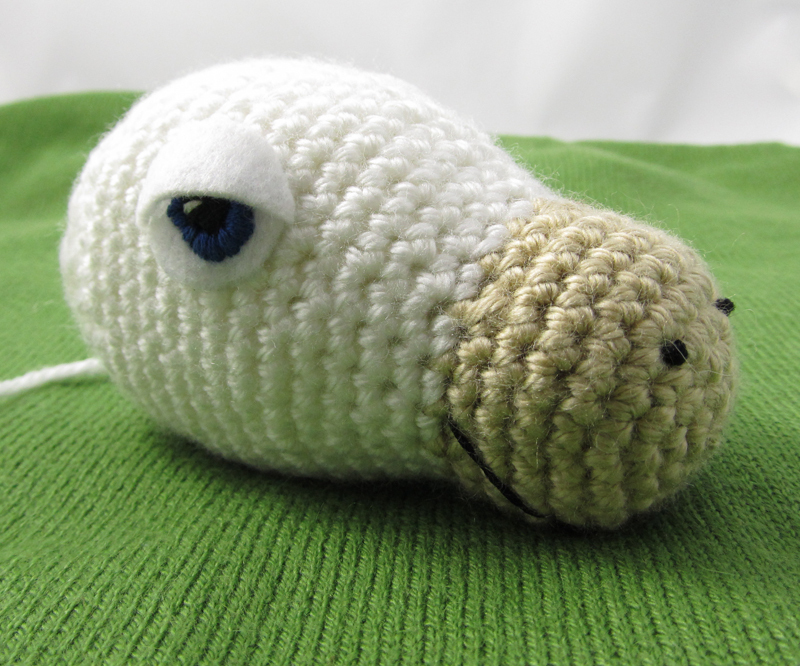 Continue with pattern to finish head. Rnd 2: Sc in ea sc around. Rnds 6-12: Rep rnd 2. Flatten ear and lay on top of beige felt. Trace around the ear with a fabric pencil. Cut felt about 1/4″ in from the traced line. 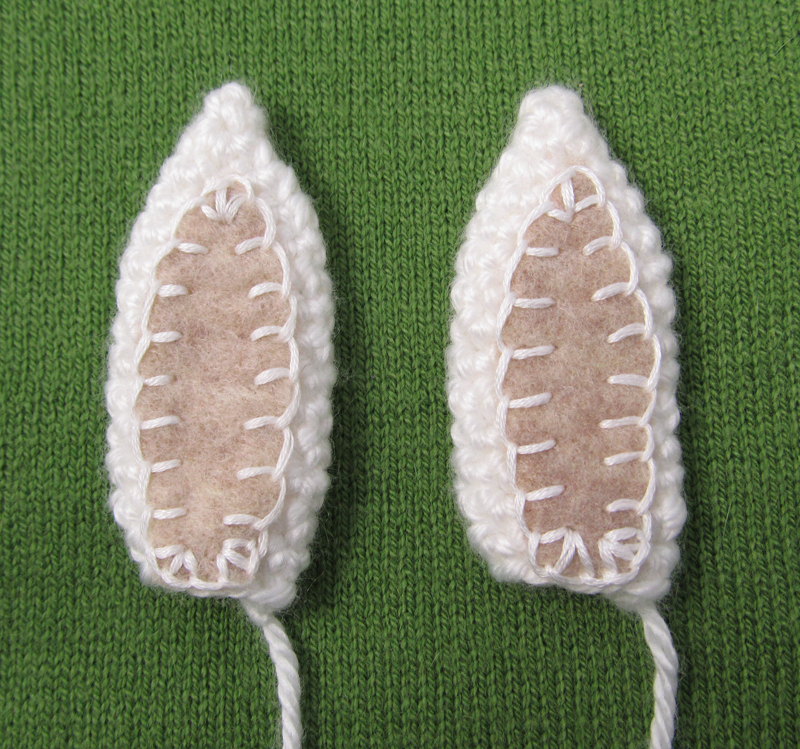 Attach this felt appliqué to the ear with white thread and a blanket stitch. Sew each ear to the donkey’s head. Rounds 4-5: Rep rnd 2. Round 7-10: Rep rnd 2, slst in next sc. FO, leaving a long tail for sewing. 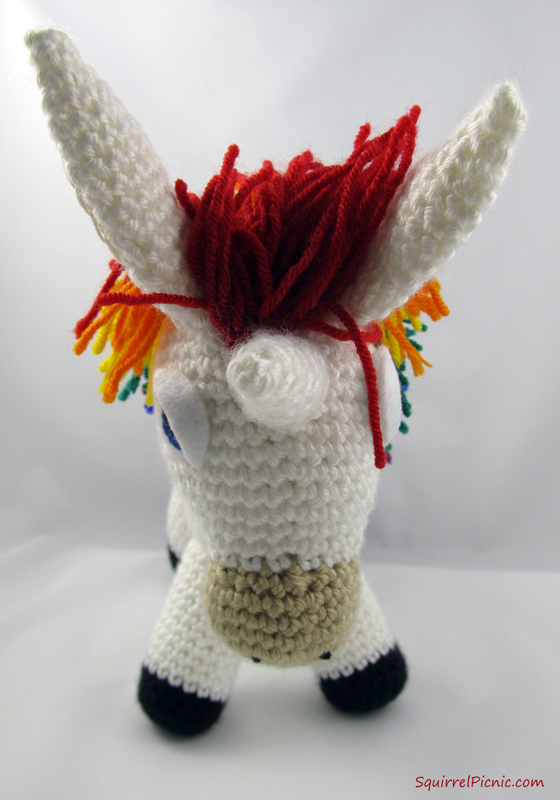 Stuff horn lightly, place between eyes, and sew to head. 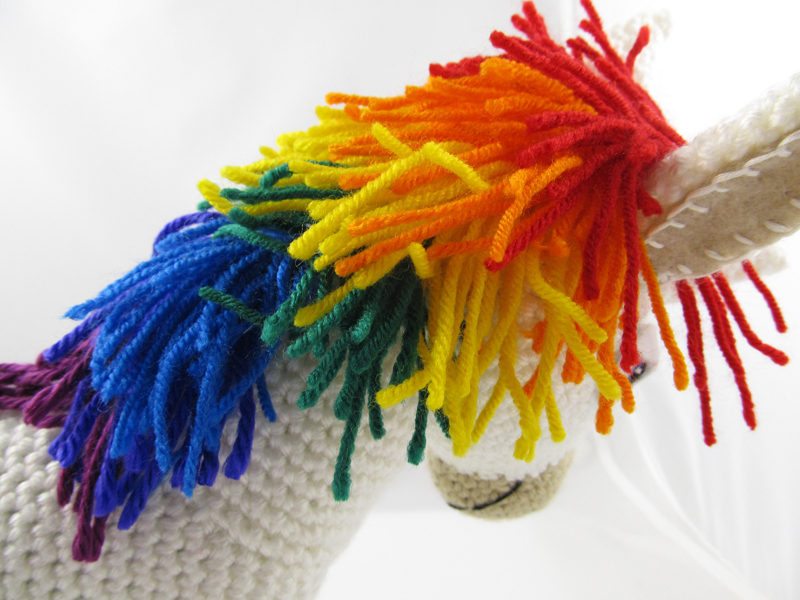 For each color of the rainbow, cut about 24 pieces of yarn, each about 5 inches long. 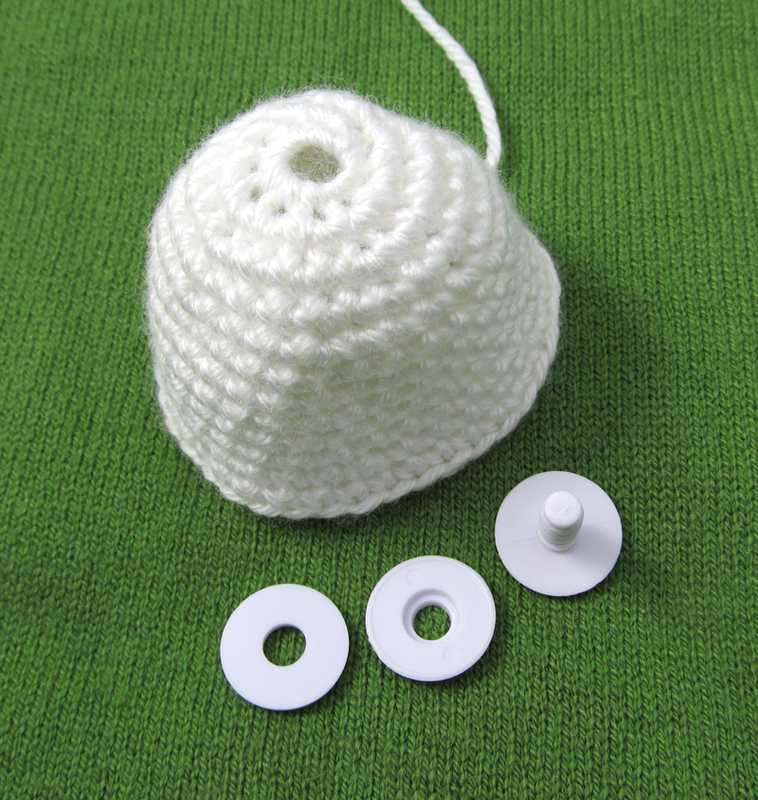 Starting at the top of the head, insert your crochet hook into a sc hole and up through an adjoining hole. Grab the middle of two strands of the red and pull through the stitch. Pull the free ends of the yarn through the loop and pull tight to secure (like latch hook). Repeat this for at least two more sts between the ears. Repeat for the rest of the colors. Trim hair if desired. I liked how wild the hair on my Rainbow Donkey was, so I didn’t trim it at all. 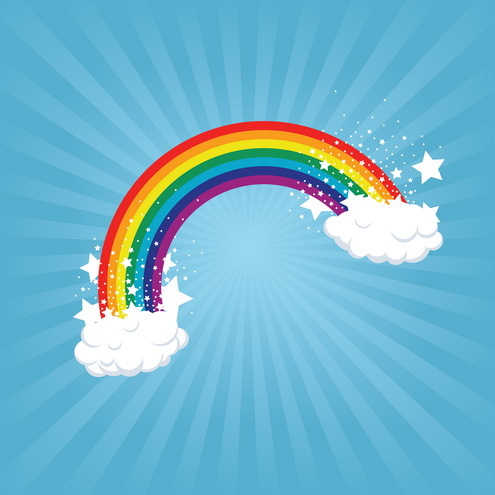 For each color of the rainbow, cut 4 pieces of yarn about 10 inches long. Mix all the strands together, keeping them relatively even on the ends. 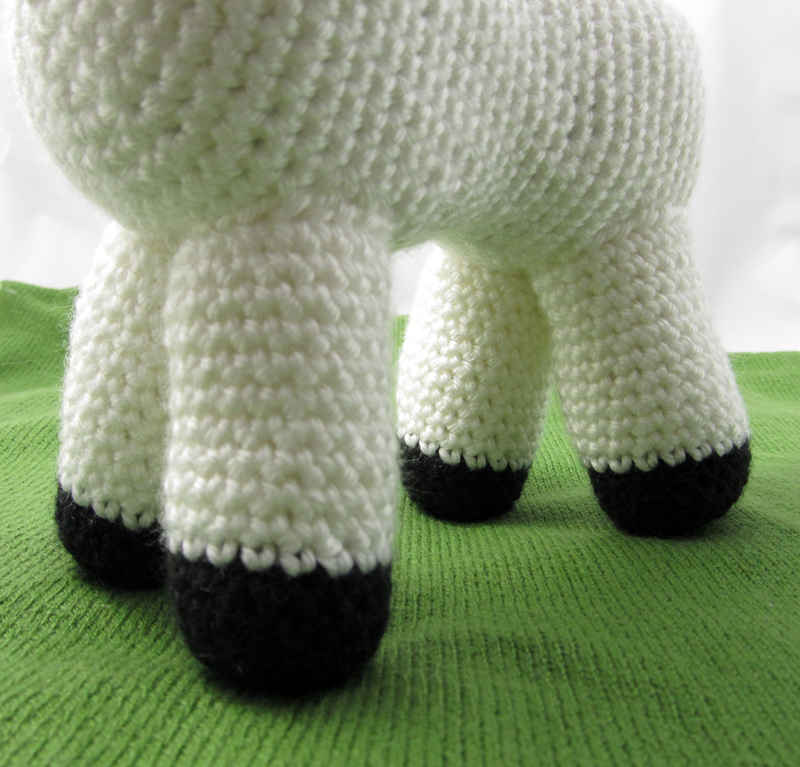 Locate a spot of the donkey’s rump where you want to add the tail. Using the crochet hook, pull the strands about halfway through this st and let them drape over. Trim if needed. Cut a heart out of felt. I’ve found the easiest way to do this is to start with a square piece of felt. Turn it so that it’s a diamond and cut a square notch into the top corner. Then round all the corners except the bottom one. Ta-da, you have a heart. Adhere the heart to the rump with hot glue or fabric glue. Bill Brown of the Evil Squirrel’s Nest Tells All! 1. Of all the characters in your comic, who do you most relate to? Evil Squirrel has pretty much adopted my personality and has essentially been my alter ego for most of his existence, so it would have to be him. ES plays the role of the regular squirrel who is surrounded by a bunch of other quirky critters and has to deal with their oddball personalities… and I think that’s something we can all relate to in life. We often think of ourselves as the one sane person in the world, and all the people we know are the weird ones! 2. Have you modeled any of their personalities after people you know in real life? Yes! Most of the people who I have come to know on my internet forum that ES and crew was born on have their own personalized “fursona” I created, and a few of those characters have found their way into my comic. Among my comic’s recurring characters, Hooly, Odyssey, Hottie, Mini and Clem were inspired by online friends of mine. Hooly and Odyssey really were polar opposite personalities who despised each other, Mini really has a daughter named Erin (though the real Mini is actually a very cool person and not the overprotective helicopter parent she portrays in the comic), Hottie is truly one of the sweetest people I have ever had the pleasure of knowing, Clem has always played an online personality of being God’s gift to women. 3. What has been your favorite episode? Oh my, this is difficult! There are so many that I really like, but not one that really stands out! As far as reader reaction goes, the no-brainer best response I got to a comic was my Mardi Gras themed comic (#41, 2/7/13). If I had to pick one, I guess I’d go with the first comic where Buster asked for a raise (#34, 12/20/12) because I think it has one of the best “bet you didn’t see that coming” punch lines I have ever come up with. 4. Is Rainbow Donkey really a donkey? No, he is just a very poorly drawn unicorn. The “donkey” part just stuck like a bad grade school nickname. 5. Does he have any special powers? If not, what super powers does he wish he had? Well, Rainbow Donkey can fly! I’ve drawn numerous scenes of him soaring through the air… in fact, anyone visiting my blog will see him gliding through the sky with Angel on his back in my blog’s header. How exactly he does this is a mystery since he has no wings, though I’m guessing there’s some Pegasus in his lineage. As was seen in a previous comic (#53, 5/2/13), Rainbow Donkey does not excrete colorful bodily fluids as unicorns are often claimed to be able to do, so his powers are certainly limited. He does have the power to win over legions of fans, and I continue to be surprised at how popular a character he has become! 6. Is Rainbow Donkey the only one of his kind? While there may be other poorly drawn unicorns out there, none of them are as down to earth and have an “everyman” persona like Rainbow Donkey does. You would think a unicorn with a bright white coat and a beautiful rainbow-colored mane and tail would be an extraordinary, magical, and even perfect creature. But he is not. He has self-esteem issues. He gets into awkward situations. If he wore them, he’d no doubt put his pants on one leg at a time just like the rest of us. He is a reminder to us all that no matter how perfect and magnificent we might think we are, we all have our faults and there’s nothing wrong with that! And vice versa… though we may seem like we have many issues in life, there’s still a part of us that’s beautiful and that makes people like us! 7. 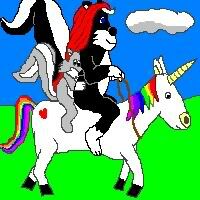 Why is a unicorn hanging out with a bunch of squirrels and possums and such? Good question. I blame my four younger sisters, whose toys of the ’80s (Rainbow Brite, My Little Pony, etc.) were quite influential on my artistic style. They supplied the colorful cuteness, and I supplied the warped sense of humor which helps make ES and the gang so unique! 8. What does Rainbow Donkey eat? I think the only thing I have ever drawn Rainbow Donkey eating before is common ordinary grass (#53, 5/2/13), although in that same comic, the “evidence” seems to suggest he’s also been sneaking candy bars from the other characters. Being the atypical unicorn who is not high above ordinary society, my guess is he’d probably prefer a Big Mac to something exotic like wild berries. Categories: Crochet It, Make It! Challenge | Tags: crochet, diy, donkey, donkicorn, Evil Squirrel's Nest, horse, how to, Make It! Challenge, Rainbow Donkey, softies, unicorn, webcomics | Permalink. You make it look so easy! Thank you for sharing with us. This was an amazing post. 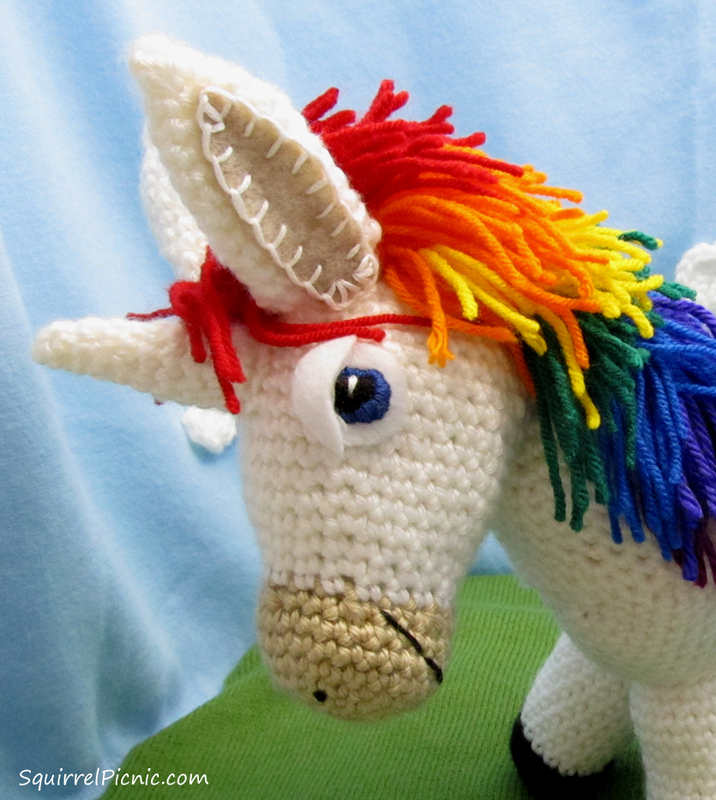 I really enjoyed the interview with Bill and learning how you created Rainbow Donkey. FUN! Thanks, Lynda! It was fun to put together, so it means a lot to hear that it is fun to read about too. Cute! I had a stuffed animal of Rainbow Bright’s horse when I was a kid. It had a Rainbow mane, just like that one. Thanks for the memories! You’re welcome, Cathy! I think I had that same horse. I loved Rainbow Brite too. Still do! Starlite was indeed one of the main inspirations behind Rainbow Donkey, or at least what I subconsciously had in my mind when I first drew him…. Ah, that’s his name. Thanks for refreshing my memory. Imagine this: Starlite vs Rainbow Donkey. Even though I loved Starlite as a kid, today my money would be on RD. This is cute! I might wanna try this soon ! Thanks so much for sharing it! You’re welcome, jsletto! Glad you like it! Oh my gosh, this blog makes me so happy 🙂 Love this installment. That’s always so nice to hear! Thanks a bunch! Wow, awesome work!! Well worth the effort that you put into it!! Well done!! Ah ! 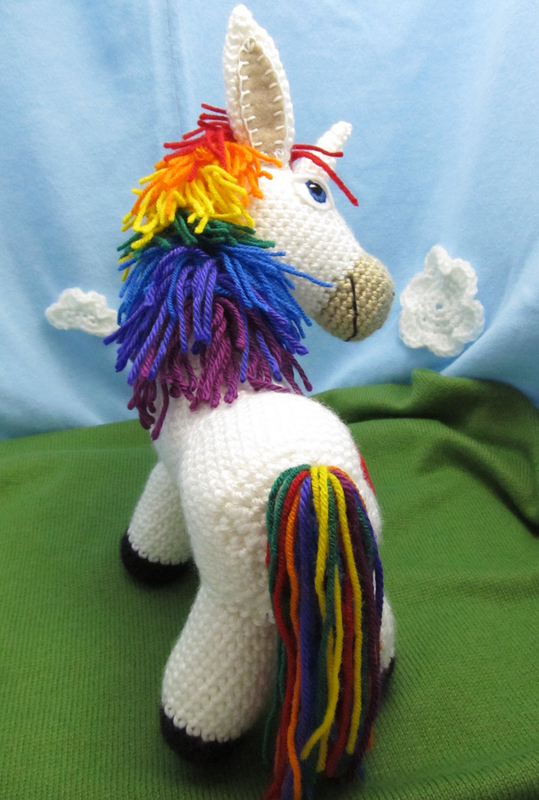 came here to check if the rainbow donkey had a pattern …and am I so happy to find it in all its glorious detail !! Thank you so much for this generousness 🙂 He is too cute for words. I plan to make one and if I succeed (whenever that is !) that will be my best ever crochet project I presume !! You’re very welcome! 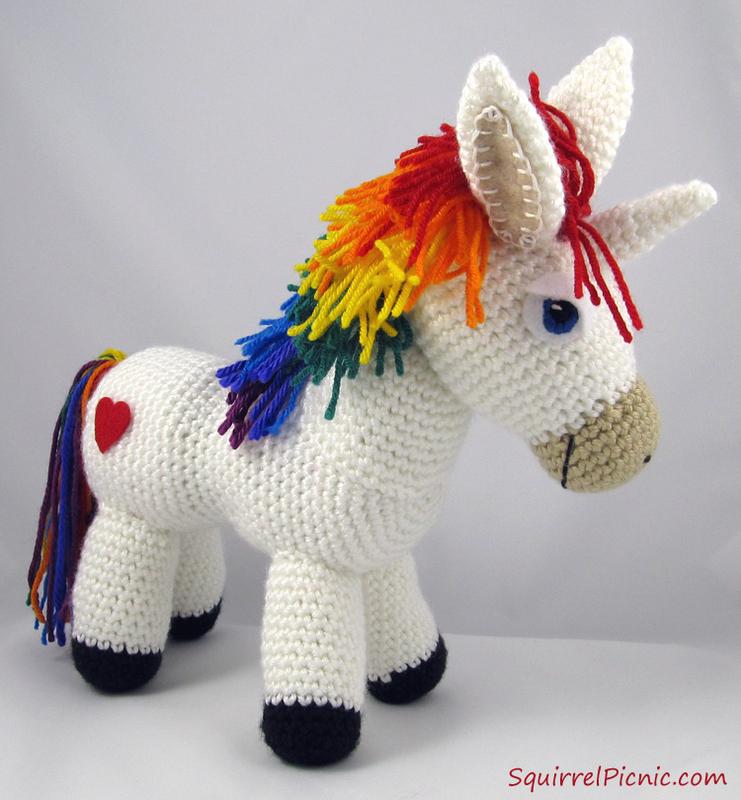 I hope you have fun making your own Rainbow Donkey. If anything goes awry (in other words, if you find a mistake in the pattern) please let me know. oh my- your work is amazing! creative, whimsical, so well-crafted. i have always fantasized about being able to crochet but can’t to save my life. but your work is definitely inspirational! Wow! Thanks, Erica! I really love all of your projects. You’re doing so many fun things over there at the dabble cafe. The donuts look soooo yummy! You’re very welcome, Joan! I’m so glad you like him. My daughter wants one so bad. If, I were to pay you, would you be a letter to make one for her? Hi, Alfred! I’m so excited to hear that your daughter loves Rainbow Donkey. I wish that I could help you, but I only provide the patterns. I don’t make the items for sale. I wish I had the time. That would be my dream job! 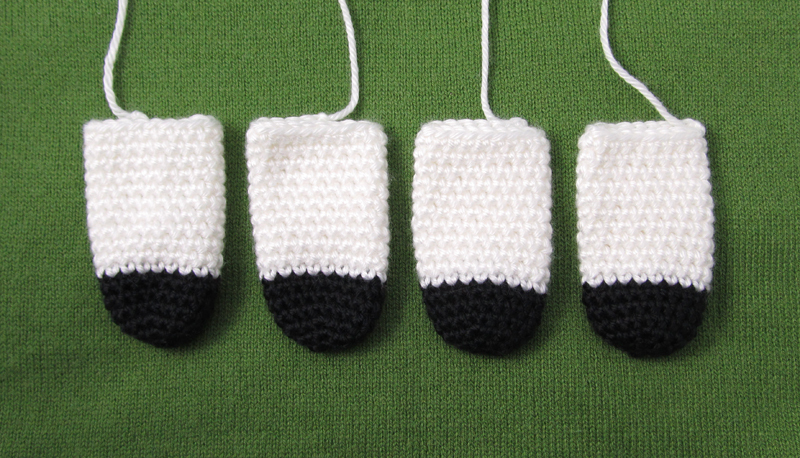 I know of other crochet artists who do sell on sites like Etsy. 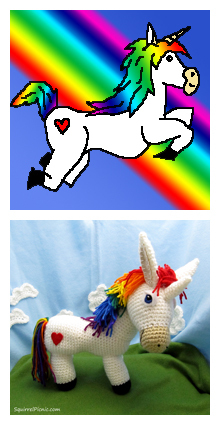 In fact, searching “rainbow unicorn crochet toy” on Etsy brings up several for sale. Hopefully your daughter will like one of theirs just as much. Thanks for visiting Squirrel Picnic, and I’m sorry again that I couldn’t be of more help. Oh, thank you so much! This mommy loves it and this will be cherished for a very long time! Thank you so much, Angela! I’m very glad you love it! Hi! What I do when I want to translate a pattern from another language into English, I cut and paste it into an online translator like Google translate. Have you tried that yet? Hello I love Donkey and I’ve downloaded his pattern I an having a little problem with the decrease in the middle of the body, on row 20 it says: dc 15 and dec 6 stitches over the next 12 But there are 36 stithes Is there a row missing, as the previous decrease is row 16 46 to 36 stitches Also is the decrease supposed to be at the same place or the opposit side? Thank you for the pattern he’s gorgeous! Hi Mags! Thanks for making a Rainbow Donkey. I am happy to help. You are right, Round 20 is worked over 36 stitches: first, single crochet 15, then dec (sc2tog) 6 times over the next 12 stitches, then single crochet 9 more stitches (15+12+9=36). With these 6 decreases, your new total will be 30 stitches. Like Round 16, this creates a dip to the donkey’s waist. In Round 16, the decreases occurred at the start of the round, but in Round 20, the decreases occur halfway through the round, which should put them at the opposite side from the Round 16 ones. I hope this helps you. Please let me know if you need anything else. Enjoy your donkey! I am working on making this but I am unfamiliar with the abbreviation “PM”(last sc at end of a row) What does it stand for? Hi Deenie! Thanks for your question. PM stands for place marker. 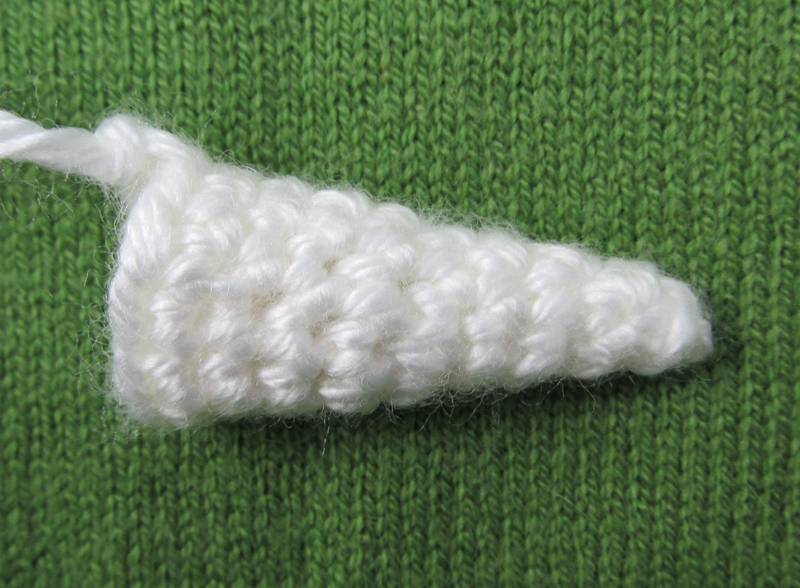 You can place a stitch marker or a piece of waste yarn in this stitch to mark it for later (you’ll refer to it again in Rnd 20). I’ve added stitch marker to the list of materials so it doesn’t come as a surprise to someone else too. If you ever need a reference for abbreviations, I have them listed in the right sidebar on my website. Thanks again! I just noticed that rd 17 & 18 are missing from the pattern. ( body). Are they just sc around? Hi Deenie! Hmmm… that’s curious. I’m looking at the pattern online right now and I see Rnds 17-19: Sc in ea sc around. Not sure what happened, but if you have any more trouble please feel free to let me know. Thanks! You’re welcome. I’m glad that worked out. I knew you could do it. 🙂 I would love to see your rainbow donkey. 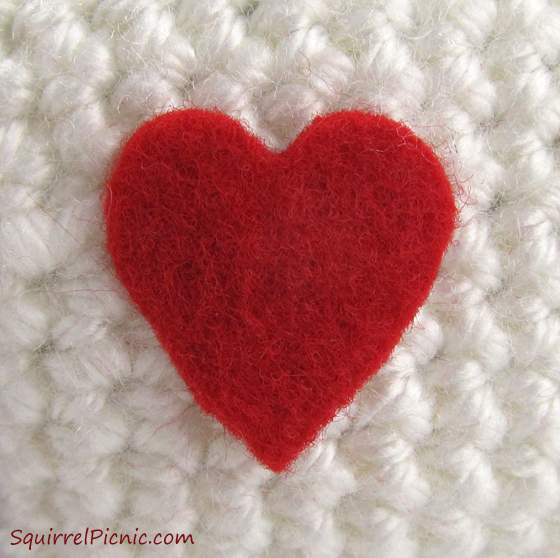 If you send your photo to squirrelpicnic(at)gmail(dot)com, I will even include it in a special feature called “You Made This!” on the blog in June. Be sure to include your name or the name you’d like me to use in the post. I look forward to seeing your donkey! I’m excited to see your version. I think it’s great when people add their own special touches to my patterns. It’s always neat to see. I know your sister will love it! That’s very nice of you to make it for her. Thanks! I’m really glad you like it.